“His dad had the idea – he wanted to get him back in the water. Otherwise he reckoned … he’d never get him in the water again,” he said. 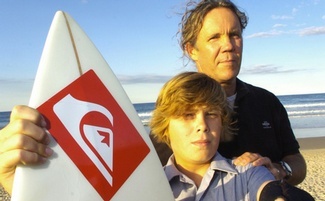 “All we really know is that some kid was knocked off his board and he got a bit of grazing,” he said. “It was no big deal, just a little mark on his board and a little graze on his body was apparently all that he got.